The phrase “POSITIVE FOR A DELETERIOUS MUTATION” still hung in the air as I clicked off the phone. All caps. The way I’d later see it written on the official test results. “I’m afraid … your test … came back positive,” she had said. My test. Even the silence of the space between the words carried weight. Although not entirely unexpected news, I was stunned. Everything changed with that one sentence. Words pulled apart, and in an instant, like the jumbled code of my DNA, my life no longer made sense. I tested positive for a breast cancer gene mutation called BRCA1 in January 2012. BRCA1-positive status carries up to 87% risk of developing breast cancer and up to 46% risk of developing ovarian cancer. I had just turned 39, and I was watching my younger sister undergo chemotherapy treatment for aggressive breast cancer. For women with a harmful BRCA mutation like ours, medical recommendations are—at a minimum—increased surveillance, but most often include removing healthy breasts, ovaries, and fallopian tubes before cancer has a chance to develop. How does a person make these decisions? How do you decide to undergo body-altering—and life-altering—surgeries, to commit yourself to a lifetime of continuing treatments, of early menopause, of no childbirth, to avoid a disease you don’t even have and might never get? How do we live with these choices and move through the experience? Creativity provided a structure that allowed me to step outside the immediacy of my emotions to gain a broader view of the issue, a different type of engagement. Early on, I approached photographer Maja Daniels about collaborating on a creative project documenting my BRCA medical journey. Maja became integral to my process: attending appointments, encouraging reflection or discussion about my own feelings and the bigger questions, and taking photographs both within the medical setting and in my daily life. 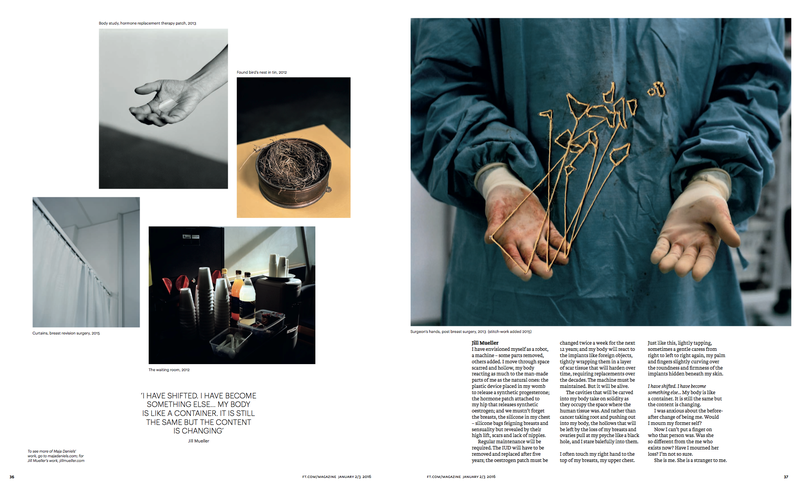 In turn, I documented my thoughts through creative writing and sketching, and eventually began creatively responding to and stitching onto Maja’s photographs. We are currently in the process of transforming the project work into a book of photographs, art and text that moves beyond ideas of “before/after” to explore an individual’s experience navigating the complex phenomenon of preventative surgeries — an experience many of us may face as personalized medicine and access to genetic information becomes more common.